We present our House Choice Real Estate PowerPoint Templates And PowerPoint Themes 1112.Use our Construction PowerPoint Templates because, Individual components well researched and understood in their place. Use our Architecture PowerPoint Templates because, Help them develop their thoughts along the way. Use our Real estate PowerPoint Templates because, They highlight the depth of your thought process. Use our Success PowerPoint Templates because, Examine each brilliant thought in thorough detail highlighting all the pros and cons as minutely as possible. Use our Future PowerPoint Templates because, Use our to enthuse your colleagues.Use these PowerPoint slides for presentations relating to "Home choice, architecture, construction, future, real esate, success". 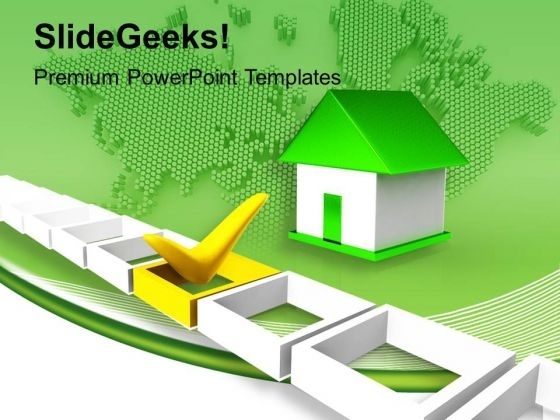 The prominent colors used in the PowerPoint template are Green, Yellow, White Keep your audience awake with our House Choice Real Estate PowerPoint Templates And PowerPoint Themes 1112. Just download, type and present. Fathom their desire with our House Choice Real Estate PowerPoint Templates And PowerPoint Themes 1112. Your ideas will go down to the very depth.